FREE DELIVERY to the GREEN AREA! Minimum spend 250£. 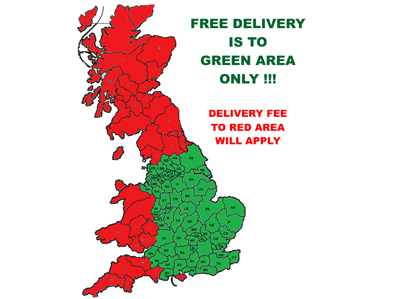 Delivery to GREEN Area with amount less than 250£ costs only 19£! Additional fees will apply for delivery to RED Area. Delivery charge is based on the weight and dimensions of the consignment. Chargers are between 19-140£ with the 140£ is being the highest we charge for any amount of items. Fee is automatically updated upon checkout prior to order confirmation. Normal delivery days are between Mondays and Saturdays. In general, we do not deliver on Sundays or bank holidays.